Go to any movie theater in the U.S., and the concession stand is likely going to sell you Orville Redenbacher’s (S CAG) popcorn. Competitor Pop Secret (S DMND) has long realized that it won’t break this kind of monopoly — which is why the company is now betting on media disruption. A few days ago, Pop Secret launched a campaign squarely aimed at people who don’t watch movies in the theaters anymore. “The home is becoming the best theater experience,” explained Bud Caddell, director of invention at Deutsch LA, during a phone conversation Monday. Pop Search is a Chrome extension that helps to find services that stream the movies you’re interested in. Deutsch set up something called Pop Secret Labs for the popcorn maker, and the agency isn’t just working on another set of ads: Pop Secret Labs plans to release a number of different apps and media partnerships over the coming year that are all meant to make in-home movie viewing more fun. 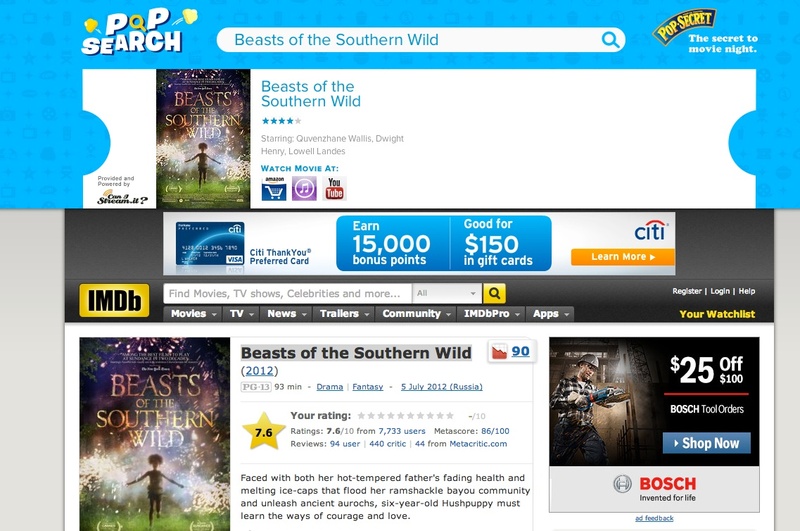 Just last week, it released a Chrome extension dubbed Pop Search that helps users to figure out which online service is offering access to which movie. Caddell explained that Deutsch is going to launch one new component of the campaign, dubbed “kernel,” every month for the next nine to twelve months. Half of these projects will be dedicated apps, and half will be media partnerships with dating sites and other online players. The whole campaign is run more like a startup, with rapid iterations, hackathons and tight launch schedules. “All of these are bets,” Caddell admitted, with the hope that at least a few of them take off. Some of these projects are less serious than others. In the coming months, Pop Secret Launch a tool called Movie Mediator that is squarely aimed at couples trying to find a movie both would enjoy for movie night. The twist: The final decision is up to the couple’s Facebook (s FB) friends. The just-launched Pop Search on the other hand is a genuinely useful tool — Chrome users can simply search for the title of a movie, or highlight a movie title on any web page and then get the necessary links to Netflix (s NFLX) and Co. via right-click — but it’s also a fascinating take on marketing in an age of unlimited choice. Just running TV spots online doesn’t make sense if you want to reach the very people that turn to Netflix to avoid advertising. “They are not looking for another branded message to interrupt them,” said Caddell. Which is why Deutsch is turning Pop Secret into a kind of mediator – someone that you turn to in order to make movie night a success. Which is really all a popcorn brand can ask for. I thnk you meant wow…not vow.